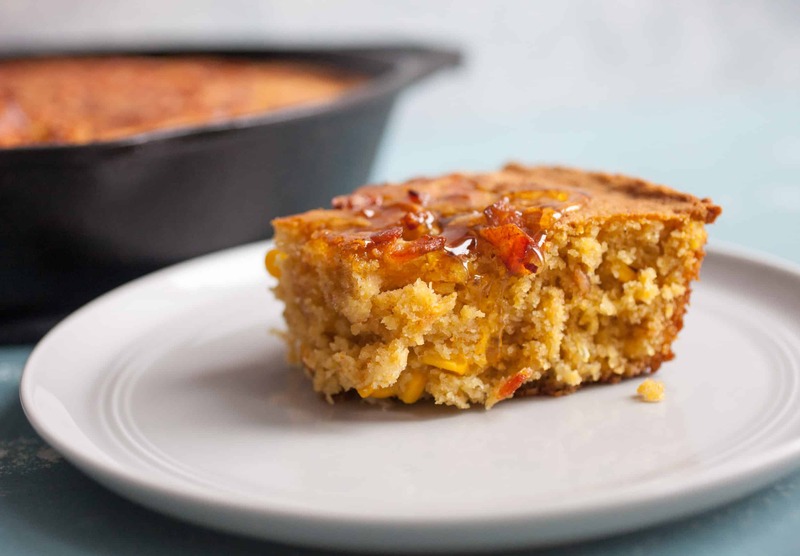 Making a big skillet of cornbread is the perfect side dish for so many winter recipes. 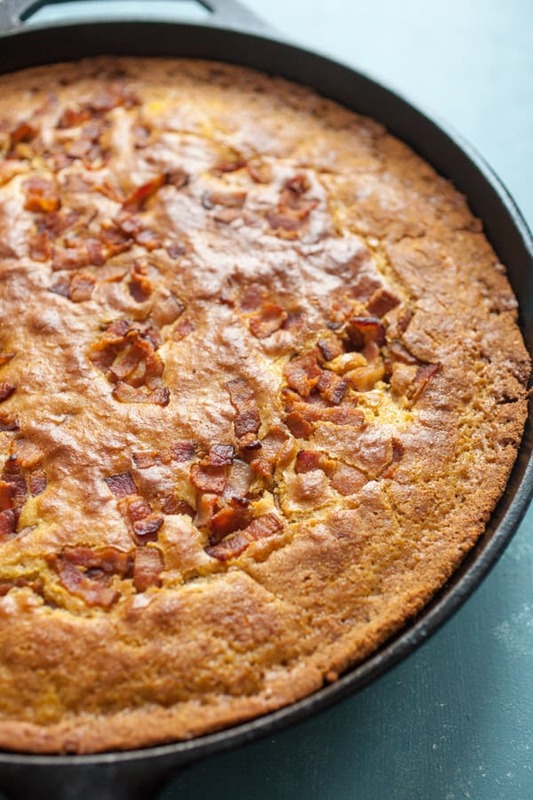 I’ll serve this Bacon Cornbread with brunch or dinner depending on the day. I’ve even been known to snag a piece for dessert, drizzled heavily with honey! Cornbread is a classic Southern side dish that’s made with cornmeal and usually buttermilk, but sometimes also stock. My favorite way to bake it is in a sizzling hot cast iron skillet, but you can bake it in almost any dish. There is a lot of debate about cornbread. Some say that it needs to be all cornmeal and no sugar. Personally, I like a mix of a little flour and also some sugar in as well. Maybe that makes this bacon cornbread less traditional, but it also makes it more delicious (in my opinion). In theory you could make this recipe without the sugar, but I think the sugar adds a nice balance to counteract the savory bacon elements. I’m not really one to stick to traditional recipes so you shouldn’t be surprised to see me change this one up, but I can tell you that it’s delicious. That should end the debate right?! There are a few tips to make perfect cornbread and I use them all in this bacon cornbread recipe. First, it helps to let the cornmeal hydrate with the liquid (in this case buttermilk) before you mix together the batter. I’ll just let my cornmeal and buttermilk sit in the fridge overnight, but at a minimum, stir them together 30 minutes or so before baking the cornbread. When it comes to baking, cornbread can take a lot of heat. I like to get my cast iron skillet hot on the stovetop, add some fat (bacon grease in this case), and then pour the batter in. The really hot skillet makes the edges crisp up around the outer part of the cornbread. SO GOOD! Here’s my recipe for Bacon Cornbread which also has corn kernels stirred in and is great served with any hearty dish like chili! Bacon Cornbread baked with a touch of bacon grease for extra flavor. The perfect brunch side item! 1) For best results combine buttermilk and cornmeal the night before and let it rest in the fridge. Combine them at least 30 minutes before you bake though. 2) To start, fry bacon slowly in a pan so fat renders out nicely. This should take 10-15 minutes for the fat to render out and the bacon to get very crispy. Reserve some of the bacon grease for later. 3) In a small bowl, microwave the honey and butter on high in 15 second bursts until the two are combined and butter is melted. 4) Stir that mixture into the cornmeal and buttermilk. Then add eggs and combine well. 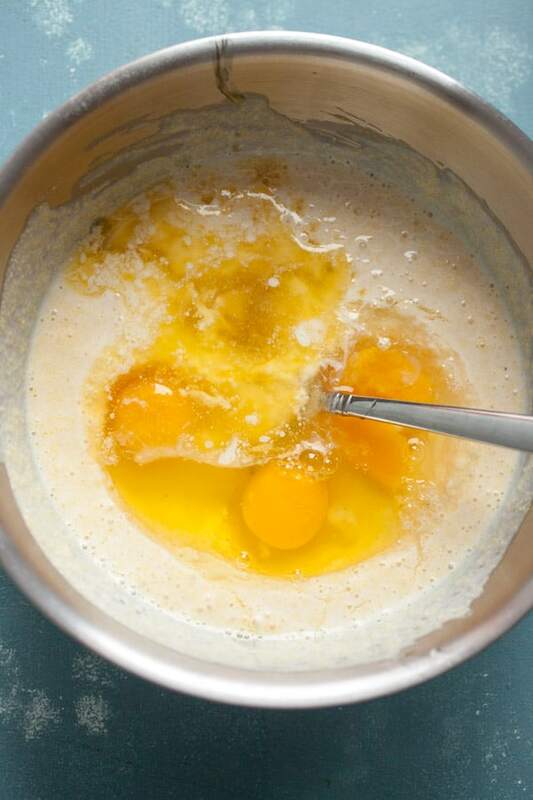 5) In a separate bowl, whisk together flour, baking powder, sugars, and salt. Then stir the wet ingredients and combine well. 5) Stir in corn. 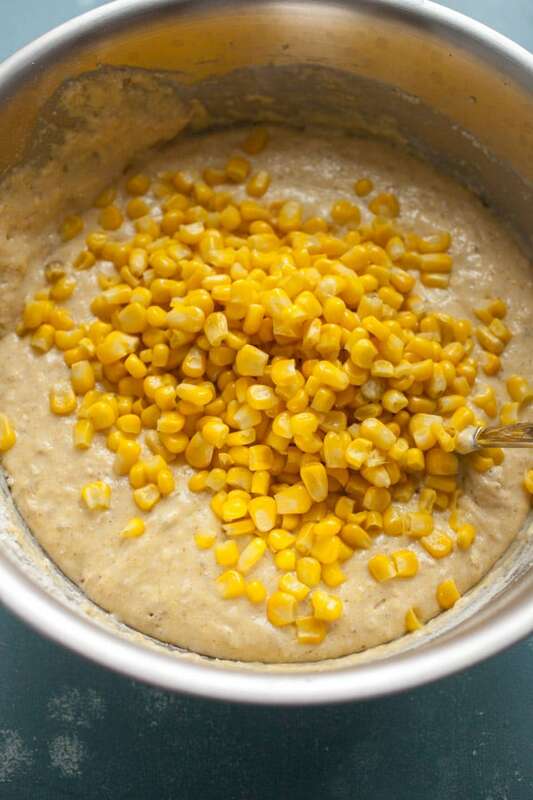 If you use frozen corn, thaw and drain it first. 6) Preheat your oven in a 350 degree oven. Heat a large cast iron skillet over low heat until pan is hot. Then add two tablespoons bacon grease. If you don’t have a cast iron skillet, you can also use a 9×13 baking pan. 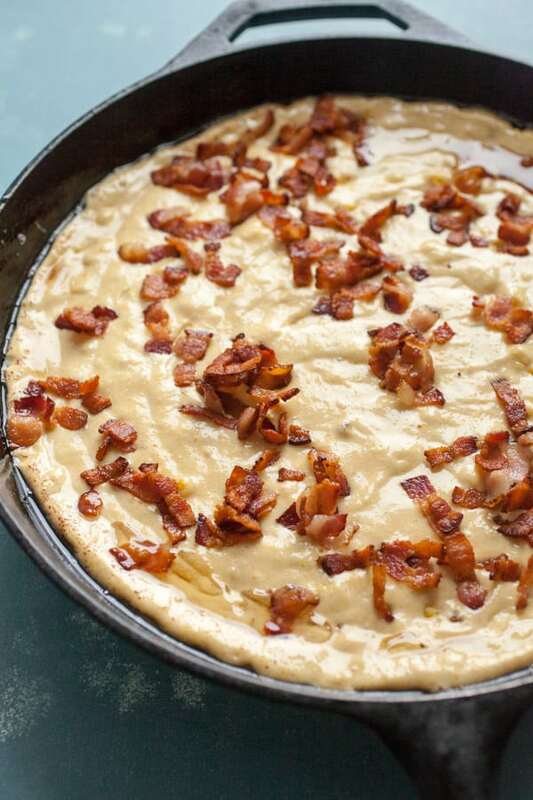 7) Pour your batter into the hot skillet and sprinkle it with crumbled bacon. 8) Bake it for 30 – 35 minutes and you are all set. Be sure to let it cool for a few minutes before you chow down. Recipe adapted from The Bread Baker's Apprentice. You need to start this recipe the night before. Measure out that cornmeal and buttermilk and let them sit to hydrate. Then you can stir in the melted butter, honey, and eggs. When you’re ready to make the cornbread, fry up the bacon over low heat so the fat renders out and the bacon gets really crispy. Meanwhile, stir together the dry ingredients! 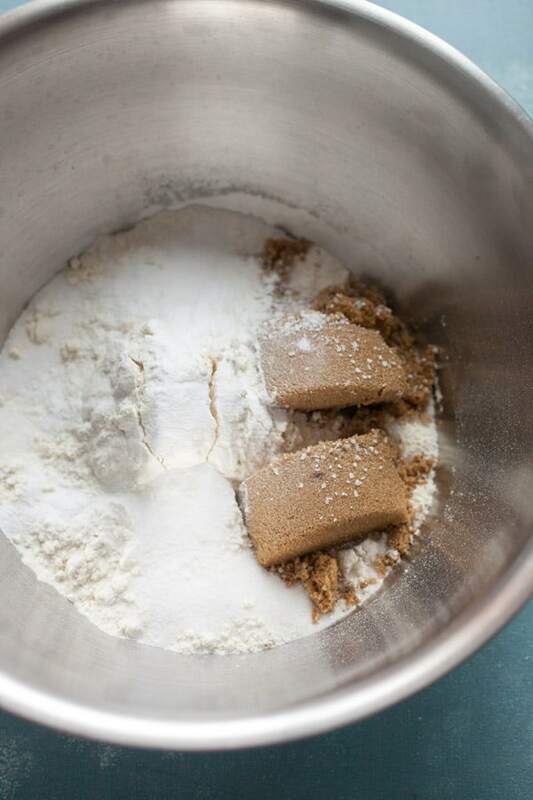 Mix the dry and wet stuff together and you will end up with a fairly smooth cornmeal batter. It should be pretty thick. Don’t worry if there are a few lumps. Then stir in all that corn. If you used frozen, thaw it first. Preheat your oven in a 350 degree oven. Get a large (at least 12-inch) cast iron skillet hot over medium heat. Then add bacon fat or vegetable oil in the dish. If you are using a glass baking dish, skip this step and just add the bacon grease to the pan and pour in the batter. A hot skillet works best though! Then pour in your batter and sprinkle it with bacon. Bake it for 30 – 35 minutes and you are all set. Be sure to let it cool for a few minutes before you chow down. This was a pretty good dish for a crowd. 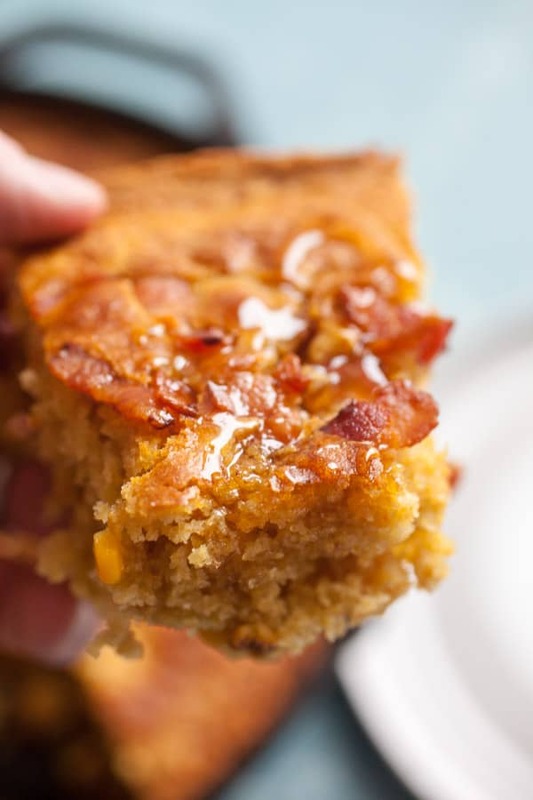 If you like bacon, or cornbread, then you will definitely love bacon cornbread. Don’t forget the honey! Looks good! I like adding bacon and corn to cornbread. That is too funny – I think I found Macheesmo from Pete Bakes and I regularly read both blogs…When I came to the site today I thought the first picture looked familiar! You both write such wonderful descriptions to compliment your food photography…thanks for blogging. That looks wonderful EXCEPT for the sugar. Being married to an Alabaman opened my eyes to the fact that adding sugar to cornbread is a mortal sin – much like putting tomatos in clam chowder. The buttermilk is de riguer, though. hey nick – thanks for the shout out! your corn bread look so good! great pics too – you must be having fun with your new SLR. Well hello new Thanksgiving recipe! Look so yummy! cant wait to make this tonight!